I have wanted to knit a bulky area rug for my office for years, and I finally found the right combo of yarn and needles to do it. What’s so great about this design is its beginner-friendliness. 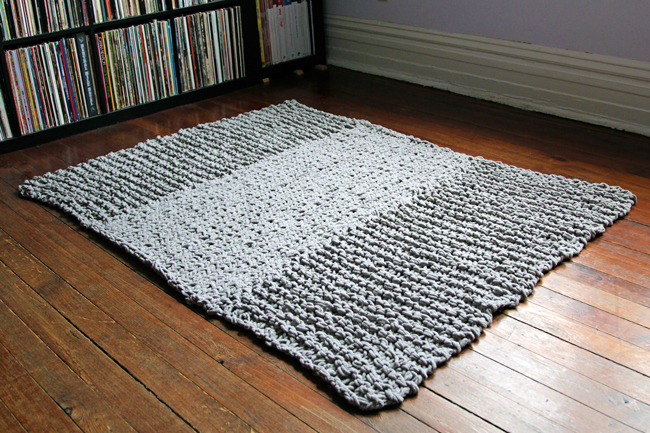 You only need to knit and purl to make this room-warming 4×6 foot rug. The yarn used is made from polyester too, so it’s machine washable! Speaking of the yarn, exceptionally bulky yarn is hard to come by at an affordable price. Size-wise, a lot of mass market yarns max out at being designed for about a size 13 or 15 (US) knitting needle. For this project, I found some yarn designed for a size 11 needle that would work as a rug, and simply doubled it up to get a bulky yarn that knits well on size US 50 (25 mm)needles for a reasonable price. Gauge & dimensions: 3 sts & 4 rows = 4″ in stockinette stitch. Finished rug measures approx. 4′ tall by 6′ wide. 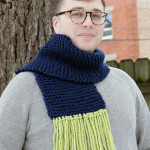 Note: This whole pattern is knit holding two strands of yarn together to achieve a bulkier look. Using two strands of the recommended yarn held double and US 50 (25 mm) needles, CO 20 sts. Continue until panel measures 4 feet. BO all sts and weave in ends. Repeat rows 1 & 2 until panel measures 4 feet. BO all sts and weave in ends. Again hold two strands of your yarn together as one.Using a tapestry needle, sew panels 1 & 3 to either side of panel 2 using an overcast stitch or mattress stitch. Weave in all ends to finish. As I mentioned in last week’s weekly picks, I’ll be winding down this season’s Knewbies/knitting 101 series today with this final post sharing the most recognizable stitch in knitting – stockinette stitch. For those brand new to knitting, here’s a video tutorial on how to knit stockinette stitch. And since two thirds of this rug is knit in garter stitch, you can check out this post for how to knit that too. 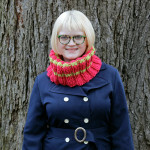 I am sooooo going to make this — just ordered my yarn at Fabric.com and got it for 2.48 a skein! Making in white for the front foyer!!!!! Thanks Heidi for sharing another grrrrreat pattern!!!! Wow, I love it! Great texture, and really lovely. And your pup seems to think it’s mighty cozy, too. that is awesome! and holding two strands of yarn together is such a great idea! it looks great! This is fantastic! I’ve wanted to make a blanket or rug for ages, but haven’t been able to find an enticing yarn that is substantial enough and still affordable. Where do you find size 50 needles? Great idea! I would suggest adding a non slip backing to it. It’s likely to shift when walking on it. Maybe attach a skid bottom they sell at Lowe’s or Home Depot. 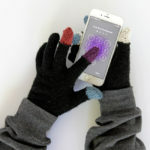 I love this idea and started knitting it up (2 strands with size 50), but I found the stitches very loose. Approximately, what gauge did yours knit up as? 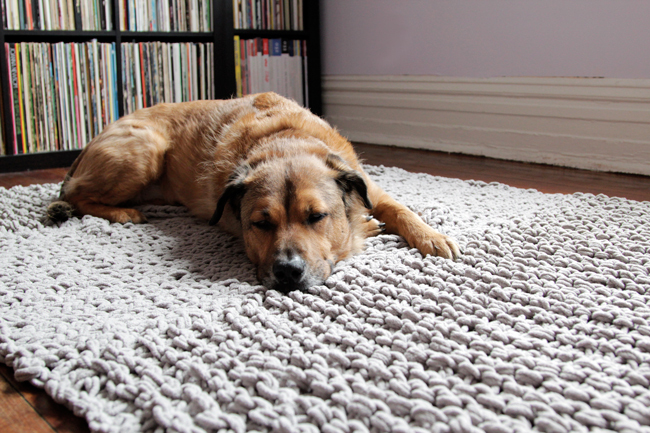 I really love the look of this rug and Woodrow proves that it’s quite comfy underfoot. I’ve been looking for a small, washable rug for a small sunroom. I think this is it! Hi Heidi. I have a question about how you sew the panels together. What stitch did you use. Like mattress st. Etc. thank you so much. I printed this pattern out some time ago and haven’t gotten around to it yet. Was thinking holding to strands of blanket yarn together my hurt my hands but it is so beautiful I am going to make it one day. You didn’t use circular needles? I am having trouble finding any needles longer than 14″.. I have only made scarves in the past so I am clueless! Yep! I just knit three large rectangles on straight needles. The work had to bunch up a little to all fit on the needle, but the finished project turned out just fine. Circular needles are certainly less fiddly to work with for this pattern, but in the past they’ve been hard to find at affordable prices. Update from Heidi, posted 8/12/18: More recently, Boye has made a circular US 50 (25mm) plastic needle available at JoAnn’s and similar stores. Thank you! Each panel is about 2’x4′, so the finished rug as pictured is 6’x4′. You could sew the panels end to end to form a runner, no problem! If you’re knitting at the listed gauge, you’ll be able to make a 2’x12′ runner using the pattern on this page. A quick caveat: You might want to do all garter stitch panels to avoid edge curling that will inevitable happen on the stockinette stitch panel. What did you use to sew the panels together? The yarn (single/double?) or what kind of thread? Thank you! The same yarn that was used in the pattern was used to sew the panels together. Doubled up and sewn with a tapestry needle. Thank you so much. I have read all of the questions and answers and you are so responsive to all who have questions and I really appreciate it. I am a beginner and it helps so much. You are awesome!! Thank you. I am inspired…. just one question — would you care to comment on the durability of the rug, now that it is a couple of years old? I am planning to use the same yarn you did. Thanks from a fellow Chicagoan! Hi, thanks for the delightful pattern, I have some ancient Lopi yarn in my stash and this will work perfectly,but can you tell me what the Canadian size needles would be in mm s please.? 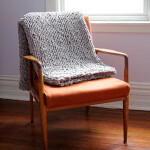 If we cannot buy Bernat blanket yarn in South Africa, what other make vould you suggest, in order to get the same look? Hi Leonie! Do you know how to read yarn labels? You need to check the labels for yarn that suits a huge needle. Here’s a tutorial on how to read yarn labels. 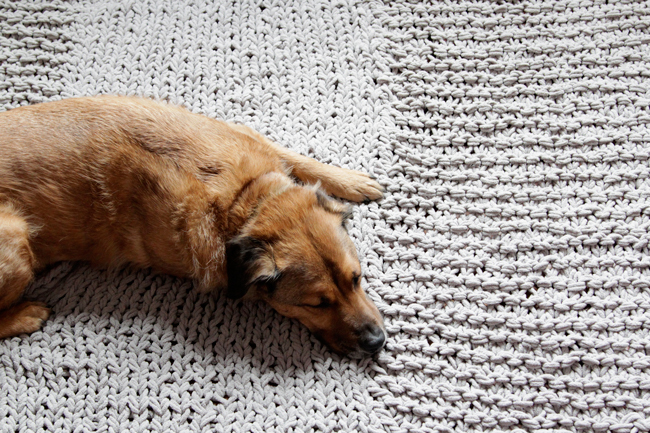 I’ve been searching for a knit rug pattern and this is it!! Thank you. I’m going to order the Bernat Blanket Yarn and just wonder about its light fastness. I’d like to put the rug in a sunny area, but I’m concerned about fading. I’m sorry, I don’t actually know for certain how light fast it is. I can say from experience with mine that it’s machine washable and my dogs haven’t managed to wreck it yet, despite being obsessed with the squishy fabric. The yarn is polyester, do it’s durable for sure. If you find more details about the lightfastness, let me know! Hi Heidi! I’m a new knitter and have really enjoyed browsing your designs! I love the concept and the look of this rug and totally want to make it. Do you have any sort of gripper or backing under the rug to keep it from sliding around on the floor? I’m imagining a slippery yarn flip-flopping around with my cats playing on it. I love the music at the beginning of your tutorials! Can you tell me what it is? Thank you for the help, your directions are nice and clear. Hello, like the earlier person commenting I have used a similar yarn with 50 needles but the stitches are SO loose? Is this normal? It feels to loose to knit up like yours in the picture…. To make the more affordable yarn work at a super bulky gauge, the loops are going to be loose, which was intentional (you’ll notice the gauge is 3 sts & 4 rows per 4 inches (i.e. 0.75 stitches per inch and 1 row per inch). If you prefer a tighter gauge you can use a smaller needle size for a denser gauge, but you’ll need to adjust the pattern accordingly, casting on more stitches and working more rows depending on the gauge you’re working with on the smaller needles. Best of luck! Thank you for the very easy pattern. 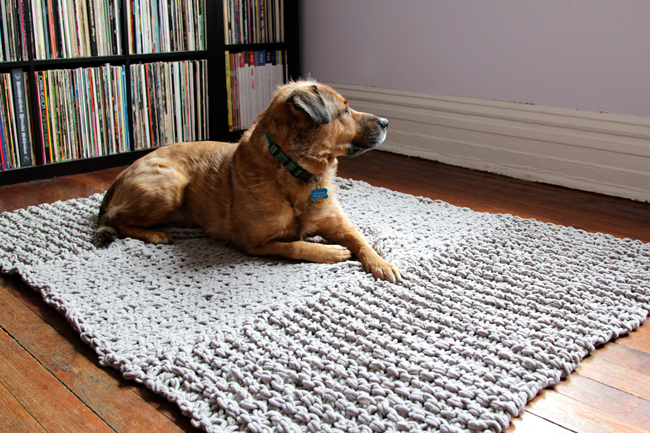 This was my first project and it looks like a rug… with a lot of holes. I know I need my gauge and tension to be worked on since I used 4 balls of yarn!